Langues de chat always appealed to me for their name alone (French for cat tongues, named for their shape) but Clotilde’s clever version caught my eye for their colour. 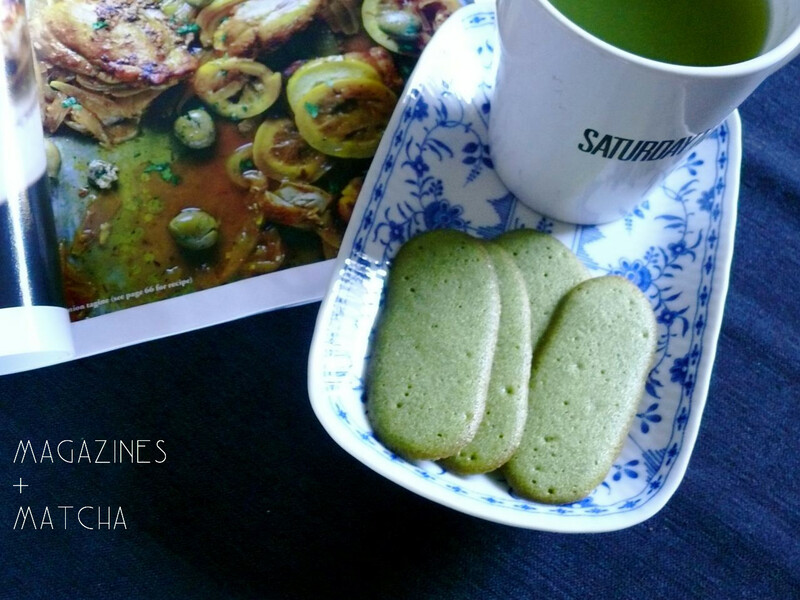 Cookies made green with matcha powder are a treat to behold and better to eat. A cup of hot matcha is a fitting pairing for its flavour and but also because each, warm virtuous and subtle sip balances out a few buttery cookies perfectly. I prefer to pair them both with another favourite coupling of mine: my couch and my magazine. Combine the butter and sugar in the bowl of a mixer, and process until fluffy. Add the egg whites and process until combined. Add the flour, fleur de sel, and matcha powder, and process until smooth. Cover and chill for an hour. Preheat the oven to 200° C (400° F) and line a baking sheet with parchment paper. Transfer the batter in a pastry bag with a 5-mm (1/5-inch) tip, or use a food storage bag and snip one corner to create a 5-mm opening. Squeeze the batter onto the prepared baking sheet to form 6-cm (2 1/3-inch) sticks, not too close to one another. Slip into the oven and bake for about 7 minutes, until the edges start to brown but the center remains green. Transfer the cookies on a cooling rack while still warm, and let cool completely. The langues de chat will keep for a few days in an airtight container at room temperature.